E.B. 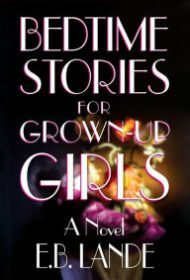 Lande delivers a knockout comic novel in Bedtime Stories for Grown-up Girls. Former business partners in a children’s soft goods enterprise, Lillian and Cydney haven’t spoken in 15 years. Lillian, a business executive with a stable home life, was often exasperated with Cydney, a zany artist with a flair for the dramatic who has been entangled in a longtime affair with her married childhood friend, Sen. Robert Bretton. Lillian and Cydney meet again while attending the funeral of Sen. Bretton’s wife. After Lillian agrees to Cydney’s request for a ride to the Bretton country home in the Berkshires following the service, a moose runs into their car. Now stranded during a snowstorm, Lillian tells stories of their past to soothe Cydney’s fragile mental status while they await rescue. In doing so, secrets come to light as the pair confront bitter feelings about the demise of their business as well as allegations of theft and betrayal. Notwithstanding an occasional heavy hand in stereotyping certain secondary characters and a title that may misleadingly suggest an anthology, the intricately plotted story is absorbing throughout its twists and surprises. This is a touching, humorous novel—one that will leave readers eagerly awaiting more from this author. BlueInk Heads-Up: This book will hold particular appeal for Massachusetts and Montreal readers, who will enjoy the local references.